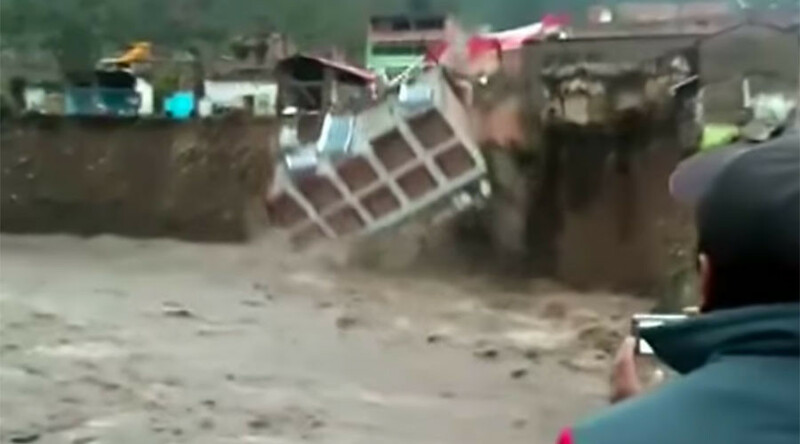 Incredible footage has captured the horrifying moment when a three-story hotel was sent tumbling into a river in southern Peru during intense rainfall. The La Hacienda hotel was located on the edge of the Sicra river in the town of Lircay in Peru’s Huancavelica region. The stunning collapse occurred after the area had been bombarded with heavy rains for more than 10 hours. The persistent downfall washed away the earth supporting the building’s foundations, which eventually dramatically gave away. No one was injured in the collapse, as authorities had evacuated the 50-room hotel as weather conditions deteriorated. Several other buildings in the town were also damaged or destroyed during the deluge. Peru’s National Service of Meteorology and Hydrology has said that heavy rains will continue to affect central and southern parts of Peru for the next few months. Three people were killed on Thursday when a mudslide sent a car careening into a truck in southern Peru. Hundreds of members of the Peruvian army, navy, and air force have been assisting with emergency relief efforts in the worst affected areas.